This protocol describes how to vary the stiffness of a hydrogel made with a 12.5 mL HyStem® Hydrogel Kit, which is composed of Glycosil® (CMHA-S, thiol-modified hyaluronic acid), Gelin-S® (Gtn-DTPH, thiol-modified gelatin), Extralink® (PEGDA, polyethylene glycol diacrylate), and DG Water (degassed, deionized water). If desired, each component can be ordered in bulk amounts. The stiffness of the hydrogel can be adjusted by varying the concentration of the Extralink and/or the concentration of the Glycosil and Gelin-S solutions. Varying the concentration of the Glycosil and Gelin-S components will also affect other material properties, such as the number of attachment sites and the overall density of the gel. In addition, these adjustments will affect gelation time - generally, stiffer hydrogels solidify more quickly than softer gels. 1. 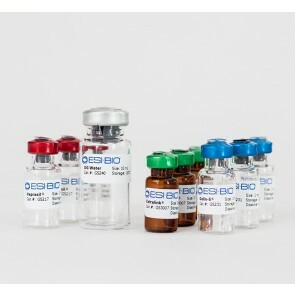 Follow the kit directions for reconstituting the Glycosil and Gelin-S vials. 2. Based on the stiffness of hydrogel desired, add the following volume of sterile DI water to the Extralink vial. 3. If plating cells on top of the hydrogel, mix equal parts of Glycosil and Gelin-S together,then add Extralink in a 1:4 ratio of Extralink: (Glycosil+Gelin-S). For example, mix 2.5 mL Glycosil with 2.5 mL Gelin-S, then add 1.25 mL Extralink. Pipette into the wells of a prepared tissue culture plate immediately. 4. If encapsulating cells within the hydrogel, resuspend the cell pellet in equal parts of Glycosil and Gelin-S, then add Extralink in a 1:4 ratio of Extralink: (Glycosil+Gelin-S). For example, mix 2.5 mL Glycosil with 2.5 mL Gelin-S and mix with cell pellet (additional media will reduce the stiffness of the hydrogel). Then add 1.25 mL Extralink. Pipette into cell culture inserts immediately. 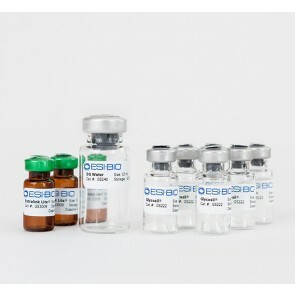 The Glycosil and Gelin-S concentrations can be adjusted by reconstituting each vial with varying amounts of DG Water. Table 2 describes a few different concentrations and accompanying volumes of DG Water. 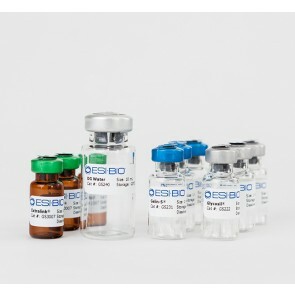 If varying the hydrogel concentration, follow the kit directions for reconstituting the Gelin-S and Glycosil vials, but change the volume of DG water used to obtain the desired concentration. Then plate or encapsulate the cells per the kit instructions. 1. The Extralink and Gelin-S/Glycosil concentrations can be varied simultaneously to further increase or decrease the stiffness. 2. HyStem, HyStem-C, HyStem-HP kits can be used instead with this protocol.